By Xah Lee. Date: 2011-11-23 . Last updated: 2019-02-14 . The Maltron keyboard, made by a company in UK. This is the first ergonomic keyboard with bowl shaped concave typing surface. The company was founded in 1977. Here's the Maltron in action. The Maltron comes with QWERTY or Dvorak keyboard layouts, but also available is its own Maltron keyboard layout. Following is a Maltron review, by a professional typer (the stenography typer in the video above). This means, if you are a programer, even if you work 60 hours weeks, the actual typing done by this guy is probably few times more than you. (i myself was once a data-entry clerk) His article is a very good one. See also: How Many Keystrokes Programers Type a Day? Maltron and kinesis are about the exact same size. 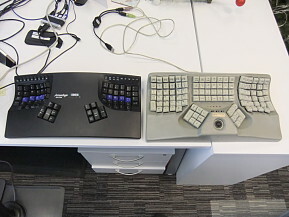 The Maltron is similar to Kinesis Contoured Keyboard. Maltron is about $200 more than Kinesis, because each Maltron is individually ordered and crafted, not mass produced. Maltron is also ugly. For each thumb cluster, it has one more key. This review is for keyboard connoisseurs. “Maltron keyboard video tour” by Chyrosran22, 2016-10-12. Note: as of 2017-04-29, the one on amazon sold by Maxi-Aids is 3 hundred dollars more than the price on the company's site.